On Wednesday, June 28th NovoEd hosted Corey Greendale, human capital technology industry analyst and venture capitalist at First Analysis for a one-hour webinar on industry trends. He spoke about key trends in the learning and development (L&D) landscape, employer and employee responses to challenges in talent development, and insights into what the future of professional development and talent sourcing holds. The following is a recap of those insights, as well as an insight into how effective learning technology will tackle this talent management trend. The world of talent development is undergoing substantial change, as several factors are driving L&D as a strategic priority for organizations of all sizes. Shortages of qualified workers in high-demand fields such as technology, sales, and marketing are making it difficult for companies to meet their talent needs through outside recruiting while the accel­erating pace of change in the knowledge economy requires workers to continually upgrade their skills. As this need for continual up-skilling intensifies, new technologies are allowing workers to take their profes­sional development into their own hands. What was once a one-in-a-year requirement is evolving into approaches that allow continuous learning within employee’s daily routine. However, many HR departments are experiencing difficulties trying to justify budget for, for example, talent development or acquisition technology. The first key development affecting talent development are changes within the labor market. 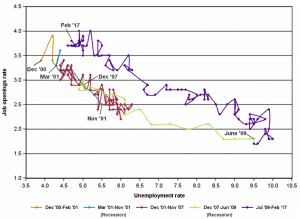 The February 2017 unemployment rate dropped to a level below what it was at the start of the last recession. Workers have more options, and the labor market has become a sellers market. At the same time, it has become more difficult to find the right people for a job. A key economic concept that shows this is the Beveridge Curve, which relates the number of job openings to the unemployment rate. Before our last recession, it would generally be the case that when the economy got better, the number of job openings went up, while the unemployment rate went down. These cycles represent a movement along the Beveridge Curve. After the recent recession, though, rather than moving up the curve to a higher job openings rate, the entire curve shifted outward: at the same level of unemployment, there are more job openings than there have been in the past. This suggests a skill mismatch, causing many jobs to remain unfilled due to a lack of qualified workers. Already weakened, the employer position will only get tougher in the future as a result of demographic developments. Data from the Bureau of Labor Statistics show that, although the total workforce continues to grow, the vast majority of the growth is in the highest age group, with aging workforce and Baby Boomers postponing retirement. The declining group at the entry-level of the labor force represent the leaders of the future. These so-called “Millennials” generally do not feel as tied to their employer as workers in the past and are always on the lookout for new ways to develop and progress. If they find limited development and career trajectories within the organization, they will look outside. Thus, organizations that are not focused on acquiring the right talent, developing them, and keeping them engaged will have a looming talent management problem. To address this, organizations will need to make investments in building its brand as an employer, building a pipeline of talent, and developing their existing talent. This also requires incorporating these in the organizational culture. On average, companies are aware of these issues and realize that their people have to be their biggest competitive advantage, and that if they’re not focused on them, they are going to lose in the long run. A 2016 survey by Brandon Hall asking business leaders what their most important strategy throughout the entire business is to achieve success showed a clear focus on people strategy, rather than other areas, such as sales, or marketing, or business strategy. 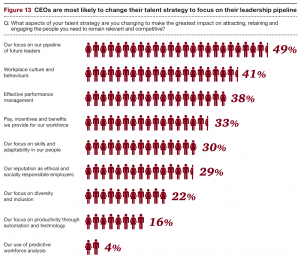 PriceWaterhouse Cooper’s 2016 CEO Survey shows that the most important thing to global leaders in their talent strategy is (1) focusing on the pipeline of future leaders, (2) showing an increasing focus on their talent development, and (3) a realization that the companies that are effective at developing their people are the ones that are going to win in the long run. They were also asked what strategies their companies are using to make sure that they have the talent in place. Few mentioned the trending topics often discussed by commentators, such as the gig economy or artificial intelligence, but rather, the responses strongly expressed a focus on recruiting the right people, having the right people in place, making sure that people work on professional development and the processes they need to succeed. Trends in corporate HR technology spend clearly reveal a belief by business leaders that technology can help make people more productive, as very few companies are cutting budget here. Within HR technology, there is a significant trends towards cloud-based technology, particularly within talent management. Data from Sierra-Cedar show that as of 2016, 66 percent of companies were using cloud deployment for their talent management solutions, which was expected to go to 72 percent by the middle of 2017. On-premise deployments is declining, for the obvious reasons of higher cost, greater deployment management, a lack of analytics, and the like. HR systems have not historically been quick to adopt mobile technologies, compared to other departments, but it is starting to catch up quickly. 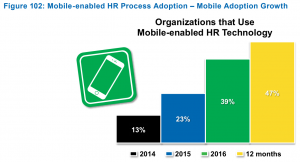 More than half of companies now have HR processes that are mobile-enabled. This trend towards mobile is welcome for L&D because of its increased flexibility and usability: training programs can encompass more informal learning, learning communities, mentoring, and other social activities. If you look at roles like sales, often employees are on the road and come to a central location only once a year. That is clearly not a sufficient channel for all of the learning they need to do, and learning technologies on mobile devices makes this possible. This trend is likely to continue. Within the HR suite, Learning and Development is the second largest area of spending, with companies investing in technologies that will enable them to develop their people in a more effective and efficient way. 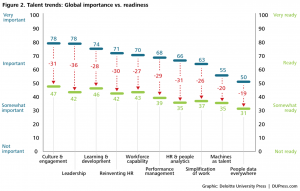 The importance places on this can be seen from survey data from Deloitte among global business leaders. At the top of the list of topics these business leaders identify as pivotal are (1) culture and engagement, (2) leadership, and (3) learning and development. However, looking at how ready they believe their organization is to address these issues shows big disparities between importance and readiness, especially in the fields of culture, engagement, L&D. This big disparity in case of L&D does not come as a surprise from a business standpoint. It is a very difficult are to measure, even if you identify what the needed skills are and determine the best way to teach them. Knowledge or basic skills are easy to test for, but more advanced skills and intangible (soft) skills are difficult to test for. Increasingly, with tools like NovoEd, there are ways to deliver learning effectively, as well as to measure the outcomes. These effective learning technology will help close this gap between the importance and readiness over time, as they help employers get the information they need to be able to focus on areas that require attention. Through technology, employers learn what their people already know, where the areas of weakness lie, and then enable learning in an effective and cost-effective way with better analytics that can help measure outcomes. The 18th Annual HR Systems Survey by Sierra-Cedar asks about the most valuable features of non-standards LMSes, and the answers show a lot of interest in features like coaching, mentoring, learning communities, intelligent learning recommendations, and learning analytics. All of these features offer great opportunities to significantly improve learning, and significantly improve business outcomes that result from this learning. Improved analytics is a key priority working its way into the HR suite: currently, only four percent of companies say they believe their approach to talent analytics is effective right now; on the other hand, 64 percent say it’s critical over time. The expectation is that we’ll see that four percent grow over time as learning technology providers like NovoEd continue to have more and more effective tools to allow better measurement and rigor. Putting analytics and data around learning in place starts a virtuous cycle: better data allows organizations to create better engagement with their systems, which leads to higher usage, which then creates more data. These data and the insights they offer can help inform decisions about organizational structure and strategy. It is safe to say that companies that are not yet on the analytics bandwagon will be left behind. Right now analytics can be a competitive advantage, but soon, a lack of analytics (and the capability to use them) will become a competitive disadvantage. In sum, as a result of economic and demographic trends, talent development is becoming a top priority for many organizations. Effective learning technology with strong analytics, on mobile and in the cloud, is a key component in improving employee engagement and driving the success of the organization. Follow this link to watch the full webinar recording with Corey Greendale.